Christmas was kind to Ginebra and Mahindra as they came up with yuletide victories in the 2016-2017 PBA Philippine Cup! The Mahindra Floodbuster ensured that they would have a Merry Christmas after putting an end to their five-game losing streak by downing the Blackwater Elite, 97-93, in an overtime duel on Christmas Day at the Philippine Arena. Mahindra, which notched its first win in the 2016-17 Oppo PBA Philippine Cup, improved to 1-5. Blackwater, which just set a new franchise mark for wins in a single conference, dropped to 4-3. Alex Mallari led the way with 23 points, 11 rebounds and four assists while Ryan Arana added 19 points in a starting role for the Floodbuster. They also had plenty of help from the bench, which was paced by Nico Salva with 14 points. LA Revilla and Joseph Eriobu each added nine markers for the second unit as well. Mac Belo finished with 14 points and nine rebounds for Blackwater. Art Dela Cruz led the Elite with 18 points alongside six rebounds and four steals. Alex Mallari (MAH) - 23pts, 11rebs, 4asts, 4stls, 1blk, 2 triples. Art Dela Cruz (BLA) - 18pts, 6rebs, 4stls, 3asts. The Barangay Ginebra San Miguel Kings gave their fans another Christmas treat as they defeated their rival Star Hotshots, 86-79, in a Holiday Manila Clasico clash on Sunday at the Philippine Arena. 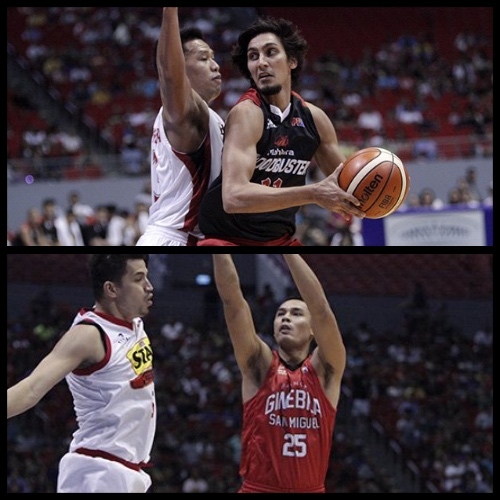 Japeth Aguilar had a brilliant performance, tallying 32 points, 12 rebounds and two blocks for Ginebra. He shot 10-for-15 from the field, a perfect 5-for-5 from three-point range and 7-for-8 from the free throw line. Joe Devance added 17 points and six rebounds while Scottie Thompson had a huge game with only five points but with 17 big rebounds and seven assists. Last year, Ginebra came back from an 18-point deficit and won in overtime on a buzzer-beating three-pointer from LA Tenorio. Both teams are now tied in the standings at 3-3. The Kings bounced back from a loss to Alaska in their previous game while the Hotshots saw a three-game winning streak snapped in this defeat. Paul Lee finished with 20 points in his first Manila Clasico appearance, while Marc Pingris had 15 points, 16 rebounds and four assists. Rookie Jio Jalalon, though, struggled heavily, shooting 0-for-10 for the Hotshots in this one. Japeth Aguilar (GIN) - 32pts, 12rebs, 2blks, 5 triples. Marc Pingris (STA) - 14pts, 16rebs, 4asts, 1stl, 1blk.